A Stamp Appraisal and a Stamp Evaluation are two very different processes. A Stamp Appraisal is a written document detailing the contents and catalog values of a stamp collection. Generally speaking, a Stamp Appraisal is only needed for insurance purposes or to settle an estate. A Stamp Evaluation, is a general review of the stamps in a collection to roughly determine an estimated market value. The evaluation results are usually given in verbal format immediately upon completing the evaluation. A Stamp Appraisal costs Forty dollars per hour versus a Stamp Evaluation which will normally only cost a modest fee unless travel and significant evaluation time are involved. We do perform evaluations of small collections brought into our store. This may be free of charge or only cost a nominal fee. Large collection evaluations, may require an appointment due to the amount of time required to perform the evaluation, however you can leave the collection at our store to allow sufficient time to perform the evaluation. Your Stamp Evaluation request may also include that we make an offer for your collection. 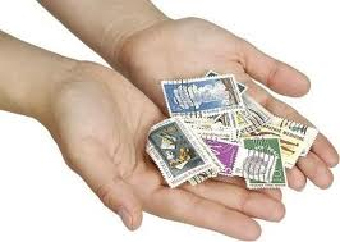 You will receive a fair offer based on the market value of your stamps. We are pleased to do this, since we are always looking to buy stamps, postcards, envelopes (covers), documents with revenue stamps, postal history and philatelic literature. In fact, you can sell us almost anything related to the mail or postal service. We buy stamps from the USA and all other known countries in the world both in mint or used condition, as well as multiples (up to and) including full sheets of stamps.